No wind throughout the day made last evening’s race doubtful as the RC made its way out onto the lake. (Thanks to Diana Voss for helping out on RC.) However, by 6pm the wind steadily filled in from the south, from Dunhams Bay to Dome Island. A W4 was selected with the RC anchored off Yankee, using the South Canoe government mark as the windward mark (all islands to port). The start saw all boats start without incident on the short line, with Spirit getting the windward advantage on most boats. Wild Thing immediately tacked off to port taking advantage of short duration lift. Cut Loose followed and the fleet swapped a lot of tacks on the upwind leg. Vaporize worked its way through the lulls to round first at the 18-minute mark and led the fleet back through the slot between Speaker Heck and Canoe Islands. Animal, Wild Thing, Spirit, and Witch Way were all close at the rounding. Vaporize gybed towards the west side of the course, opting to not cover Wild Thing and ran into one of the lulls spotting the course just a few minutes later. Animal tried the extreme east side and also lost ground. Wild Thing stayed slightly east of Spirit and Witch Way and established the lead into the second mark. The next upwind leg looked very spotty so the RC changed and shortened the course to a line between the RC and a point on the south island. Coming out of the leeward mark, Spencer and crew stayed in a stripe of higher velocity wind to establish a solid lead. Spirit and Witch Way, in close company, followed next. Spencer continued to move away from the fleet with an isolated lift and two quick tacks up the final leg. Spirit held off Witch Way while Vaporize, a few boat lengths back, tried to find wind on the eastern side of the course. Brad found himself in between Witch Way and Vaporize on the last leg. Even though the wind got even more spotty, the velocity in the other spots was quite high. Spencer on Wild Thing led the fleet across the line by more than four minutes, but Spirit had gained enough ground to take the win for the night by just 15 seconds on corrected time. Witch Way took third both across the line and on corrected. With two races left in the season the point race for third and fourth is close. Race 14 was sailed under clear skies with a consistent south breeze blowing at 5 -7 knots. 11 boats made it out to the W6 course, with Hogback as the windward mark and a tetrahedron for the start and leeward mark. The line was set with a pin-end favor. With most boats opting for a mid-line to pin start, High Jinx pushed Vaporize dangerously close to being called over early. Uncle Ludwig ran out of line and needed to gybe around and weave through the rest of fleet, crossing T on port. Wild Thing tacked to port early and pulled a few more boats to the west side of the course. Vaporize, Witch Way and Spirit were among the contenders looking to the east side for advantage. At the first mark Dave led the way. Wild Thing and Brad’s J/80 slipped ahead of Witch Way, which was clearly leading the J/24 pack. A late set and hourglass on Brad’s boat would shuffle the pack by the next rounding. The sport boats split again on the downwind, with Vaporize heading west, Wild Thing down the middle and Brad out east. The J/24 fleet had a great run straight down the middle with a few gybes to keep lined up on the tetrahedron. Vaporize and Wild Thing led around the mark again but Witch Way, Spirit and Uncle Ludwig got ahead of Brad. Vaporize held off Wild Thing until the second downwind rounding where Spencer, sticking to the east side, crossed Dave just a few yards from the tetrahedron and headed back towards Hogback in slightly increasing wind velocity. With the sun setting behind the western ridge the RC moved up to Hogback for the finish after five legs. Vaporize got ahead of Wild Thing on the last leg for line honors and Witch Way won on time after crossing the line third. Meanwhile, Spirit covered Uncle Ludwig on the eastern horizon where they fell into the wind shadow of Long Island. This allowed woot! and Windog to cross the line ahead of them. Cut Loose was able to nip out Uncle Ludwig at the finish, widening the point spread between Spirit and Uncle Ludwig. Congratulations to Alfie and crew on Witch Way for another win, Spencer on Wild Thing took second by four seconds over Dave on Vaporize, and well-done to Windog for making up a lot of ground in the final leg. The full results are below with a synopsis of the series standings. Next week will be a full moon and a raft-up will take place directly after the last boat finishes, weather permitting. Also, the end of the year celebration at Carl R’s is being planned and this year some extra “prizes” by Gill will be drawn, using a random number generator based on boat and crew position. Please attend the party to find out who the lucky ones are! 14 boats came out on a beautiful warm evening, with enough wind to send them to the Diamond Island mark W on a simple W2 course. It’s been a while since the wind has been favorable for this classic course, and a lot of boat crews expressed their appreciation. Animal, hunting the pin end, ran out of line and had to gybe and duck through the fleet at the start. Many boats tacked off to port to clear air at the start but by the time the fleet approached the slot between Speaker Heck and Canoe islands, most boats had completed a half-dozen tacks. High Jinx was seen crossing lots of bows on starboard tack in the Speaker Heck slot. The typical Dunham’s Bay lift never materialized, but the veterans of this course were hedging their bets and staying to the east. woot! was out on the west side of the course without losing ground. Vaporize headed into the Diamond Island mark and threw in a couple of big scallops, rounded first and set their chute quickly, a couple of minutes ahead of Witch Way and woot! and Spirit. The downwind run saw Vaporize increase its time differential on Witch Way back through the slot. As the wind started to fade and switch to the west, the leading boats dropped their spinnakers for a close reach to the finish line. Vaporize held on the their chute and then at the last minute dropped it and came up smartly to finish, leading the fleet wire to wire. Witch Way crossed the line next and took the victory for the night, with Spirit and Wild Thing in close company. The first four boats to finish stayed ahead of the wind fade. Vaporize took the bronze position on corrected time. Race 13 gives us our first throw-out for the second half, with the top boats in a tight point race. Witch Way has a commanding nine-point lead overall. 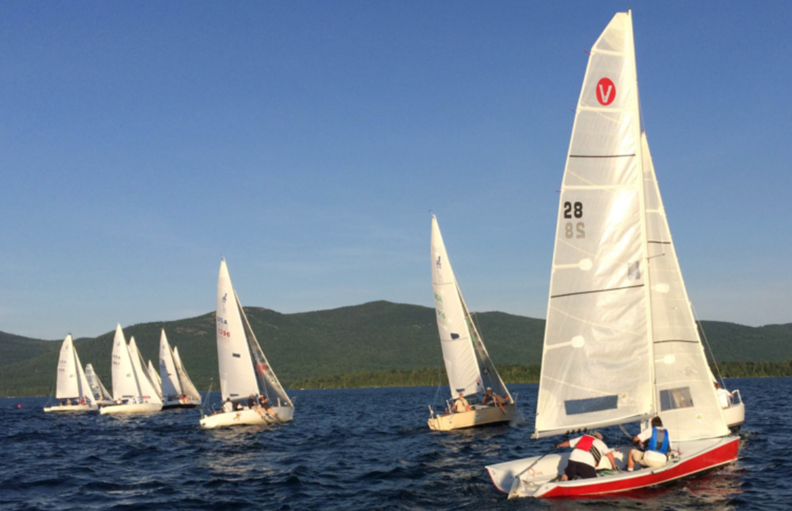 Lake George provided yet another opportunity to test both the competitors and the RC with circling winds. 15 boats came out to race on a very comfortable evening. Welcome to Rik and the crew of Brass Ring and the crew from Y-Knot, sailing a Sonar! The initial I5 course set in SE winds had to be changed as the competitors closed on the starting area. A 60° shift to the south left the RC with little choice but to start the fleet and make needed changes during the first leg. 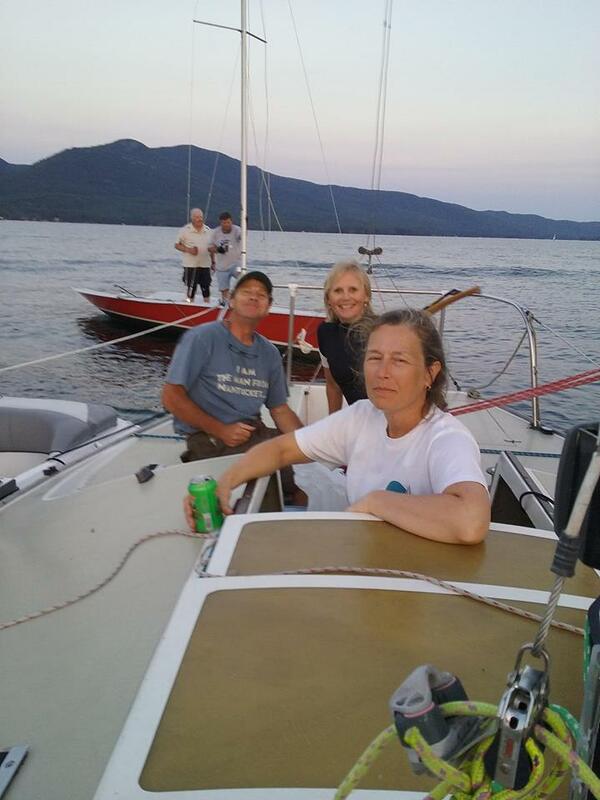 The racers worked their way toward Hogback in a steady 6-knot breeze. Most opted to go east initially. Vaporize, Witch Way and Wild Thing were leading the pack as they headed back “up” the lake towards Cotton Point government mark. The wind continued to go west as the fleet as reached for the leeward mark. Then all were forced to drop their spinnakers and resort to headsails for a beat to Cotton Pt in the last ¼ of the leg with winds dropping dramatically. Vaporize seemed to stop on the western side of the course while Wild Thing was moving steadily on the eastern side. Then it changed again, Vaporize caught a lift and led the way around Cotton Point, completing the second leg. During that second leg, the RC dropped a mark to the east of Cotton Point in an effort to keep the course square and then retrieved the original marks and got back to Cotton Point to communicate the course change with multiple sounds, C flag, red flag to indicate the course had been changed to port, and a radio broadcast of new heading. The wind increased again and the fleet got their spinnakers flying once again. With a slight reordering at the rounding, the lead boats headed back to Cotton Point where the RC was anchored on what was to be the final leg. As the lead boats approached the committee boat a shortened course was communicated and Vaporize led the way across the line sticking to a northerly route. Meanwhile Spirit passed Witch Way and Wild Thing on the southerly side. Uncle Ludwig and Cut Loose edged out the two sport boats for third and fourth, respectively, for the evening. The raft up after the race was graced by a beautiful full moon cresting Pilot Knob just after dark.